Every Man II is a Whole-Food Complexed multi-vitamin formulated specifically for the needs of men 40+. Organic herbs and cultured whole-food complexed vitamins & minerals work together to promote optimal health and condition-specific benefits-- not just address nutrient deficiencies. * Supercritical Saw Palmetto, Nettle Root, and Pumpkin seed oil work together to promote prostate health. * Whole-food complexed B-vitamin complex and whole foods like organic Oregano support heart and eye health. 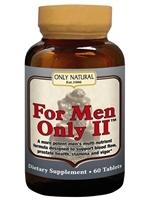 * A Whole-Food Complexed multi-vitamin for Prostate, Heart & Vision health. * Made with organic vegetables and herbs. Formulated specifically for the needs of men over 40. Easily digested, even on an empty stomach. A Whole-Food Complexed multi-vitamin for Prostate, Heart & Vision health. * Made with organic vegetables and herbs. Formulated specifically for the needs of men over 40. Easily digested, even on an empty stomach. A Whole-Food Complexed multi-vitamin for Prostate, Heart & Vision health. * Made with organic vegetables and herbs. Formulated specifically for the needs of men over 40. Easily digested, even on an empty stomach. Supports prostate health and healthy aging with a combination of whole herbs and whole-food antioxidants. Also known as Bearberry, this herb has a long history of use for urinary tract infections. A source of the phytochemical arbutin, it is metabolized by the kidneys and excreted as antibacterial hydroquinones. Hydroquinones are an active antimicrobial especially in alkaline urine (do not use with Cranberry juice). It is useful for cystitis, urethritis, prostatitis, and mild nephritis. Uva-Ursi is contra-indicated for pregnant women. Stinging Nettle root has anti-inflammatory activity and is used for treating benign prostatic hyperplasia. Its activity is different than many other popular "prostate" herbs as it inhibits aromatase, preventing conversion of cholesterol into hormones in the prostate. Urtica, combined with Saw Palmetto, Collinsonia, and White Sage, is vastly more effective than any one of these alone. This product is not intended to diagnose, treat, cure or prevent any disease; the law applicable to dietary supplements, the Dietary Supplement Health and Education Act of 1994, commonly referred to as DSHEA, does not permit us to do so and it is not our intention to do so. The Contraindications and Potential Drug Interactions information provided on this website is not intended to be all-inclusive. Keep your healthcare provider informed about any herbal and other dietary supplement products that you are taking. The early 20th century American physicians (Eclectics) prized Red Clover as an excellent alterative. Alteratives, known in folk medicine as "blood cleansers," were seen as herbs that assisted organs in the removal of metabolic waste and toxins from the circulatory system. This valuable herb was the main ingredient in several traditional formulas such as the Hoxey Formula and the Trifolium Compound. More recent studies indicate that Red Clover has phytoestrogenic properties, and it is currently being investigated for menopausal symptom relief. Holistic practitioners believe that phytoestrogens in plants help to normalize estrogen levels by their weak estrogen-mimicking ability. This activity is under investigation. Don't wait for prostate problems to appear before you start using this bulk herb tea. Prevention is the key to health! This blend, formulated by Medical Herbalist Claudia Joy Wingo, nourishes the prostate gland protecting against hypertrophy while providing the body with testosterone precursors for strength and vitality. Directions: Make up as a decoction, boiling 1 tsp of herb mix in 10 oz of water for 5-15 minutes. Drink 1-2 cups daily for maintenance, 2-3 cups if prostate problems are occurring. The fruit of Saw Palmetto is used to promote prostate health. * Similar to fennel and anise, celery seed has a grassy, hay-like, slightly bitter aroma and taste. Turmeric's warm aroma, bright color, and gingery/peppery taste are relied upon in cooking throughout Asia. It's best known as the spice that gives curry powder its distinctive color, but it also has great medicinal value. Owing to its support of urinary tract health, cornsilk has traditionally been used to address concerns of the kidney, prostate, and bladder. * The dried stems, leaves, and flowers have been traditionally prepared in tea infusions, as a compress, and in baths to support respiratory and skin health, for first aid, and to support a healthy immune response. * Tribulus has been used in Ayurvedic and other traditional herbal practices as an aphrodisiac and to restore overall vitality. More recently, the herb has been researched for possible use in supporting kidney and cardiovascular health and as a support against some skin conditions. Provides holistic support for your prostate health, supporting normal urine flow. Male Response™ invigorates the sexual response while helping to support the health of the prostate gland, revitalizing energy levels, and nourishing the adrenals. natives of South America to support the digestive system. strengthening tonifiers and herbs that help support the prostate. the prostate. These two botanicals are combined with damiana (Turnera aphrodisiaca) and supporting herbs create a comprehensive botanical supplement for men. Saw Palmetto is a relaxing herb with a normalizing effect on the prostate and hormone levels. It is commonly used in treatment for enlarged prostate or BPH (benign prostatic hypertrophy). production, throughout the day. Solaray offers Pygeum & Saw Palmetto with CranActin®, a natural dietary supplement that provides optimal all-natural support for an overall healthier prostate.